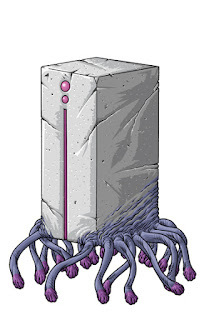 In the fiction of Ramsey Campbell, the L'gy'hxians are squat, cube-shaped creatures of living metal, native to the planet Uranus. They briefly played host to the Insects of Shaggai following the destruction of their homeworld, but ultimately drove the Insects off-world as a response to their religious rites. Some L'gy'hxians may have come to Earth with the Insects, possibly as slaves. 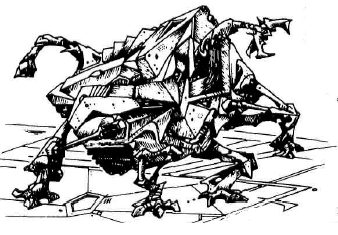 I'm kind of surprised at how many times I've seen these creatures pop up in scenarios, given the fact that they're metallic cube-creatures from Uranus. They appear in the adventure "Death by Misadventure" in the book Terrors from Beyond, in which they are missionaries looking to spread the worship of their bat-like god Lhrogg. One also appears in the MULA monograph "The Big Book of Cults," associated with an unscrupulous plastic surgery clinic. I feel like I've seen a third appearance, but I'm not recalling it right now. So right away we have an interesting dichotomy for these creatures: religious fanatics or consummate scientists? Either way, they don't want anything to do with Azathoth, at least in the form that the Insects from Shaggai worship it, which seems wholly reasonable from both angles - both as a competing religion and as "they're worshiping an atomic explosion. Maybe we don't want that in our backyard." Attacks: 1 attack using an alien weapon (most commonly a thin slashing blade capable of cutting through metal as readily as flesh, or an electrical whip). Other weapons are possible, even likely. Armor: 19 points of metallic "skin." Spells: On a successful Extreme Intelligence roll, the L'gy'hxian knows as many spells as the number shown on the dice. One of these will always be Contact Lhrogg. Sanity Loss:0/1d8 to see a L'gy'hxian. So what do we do with the Inhabitants of L'gy'hx? Well, let's take a look back at that dichotomy I mentioned earlier. The L'gy'hxians have strong religious beliefs and advanced technology; as noted in the Malleus Monstrorum, they're not necessarily hostile, but they are curious. To that end, I'd equip them with spells that tie into these ideas of proselytizing and exploring. Gate spells are going to be the big one, because this lets you bring the L'gy'hxians to Earth without relying on the Insects. Spells like Mind Transfer would allow them to wander undetected among humanity, observing and studying, Suggestion lets them plant the seeds of L'gy'hxian ideas into human minds, making people more tractable for the purposes of conversion - either spiritual or physical. Another point I'd like to make here is - look at the literature of the UFO world, especially cattle mutilations, abductions and the various Contactee movements that have sprung up here and there since the 1950s. People tend to only associate flying saucer lore with the Mi-Go, but I think it offers a lot of good, gameable ideas that can be used with any aliens. The Malleus Monstrorum uses an altered image of Ezekiel's Vision as the image associated with the L'gy'hxians, and the description of "wheels within wheels" described in the Bible is often cited as evidence of a UFO encounter in the Bronze Age Mediterranean by ancient astronaut proponents. A ranch in an obscure corner of Utah begins experiencing a series of cattle mutilations over a series of weeks; the cows having been literally taken apart, the pieces neatly arranged around the main part of the carcasses. The owners of the ranch begin reporting strange lights and nocturnal encounters - noises on the porch or the roof, like something heavy moving around slowly. UFO investigators begin to investigate the area, interviewing the owners, setting up motion cameras, etc. Then the owners of the ranch begin claiming to have been contacted by aliens, having been given a message of "perfect peace" to deliver to the world. The aliens are spiritually superior to Mankind, and are willing to serve as Messiahs to lift us out of our current benighted state. The ranch metamorphoses into a church, preaching the message of salvation via alien intervention. The aliens' god, an angelic creature of wings and eyes, is praised and venerated. The church attracts converts and devotees the way any new religious movement does, drawing in the lonely, the forgotten, the ill and desperate. There's an undercurrent to the message, only given to those who have served the church faithfully and done their part to spread the teachings of Lhrogg. For the chosen, there is a special heaven that awaits - they will be whisked off to the aliens' homeworld, to dwell in beauty and wonder forever. The ranchers-turned-preachers are no longer human; their bodies have been taken by L'gy'hxians, their minds consigned to a slow death inside the alien metal bodies of these invaders, kept securely locked in the storm cellar under the ranch, slowly asphyxiating in the thin, oxygen-rich atmosphere of Earth. Whether they are looking for converts to take to L'gy'hx as slaves (surgically altered and mechanically augmented to survive the pressures and atmosphere of Uranus) or to Uraniform Earth into a colony world for their own kind to inhabit I leave to other Keepers.